« Star Wars : The Clone Wars » was the starting point of the Acne Studios by Jonny Johansson Autumn/Winter 2010-2011 Collection. 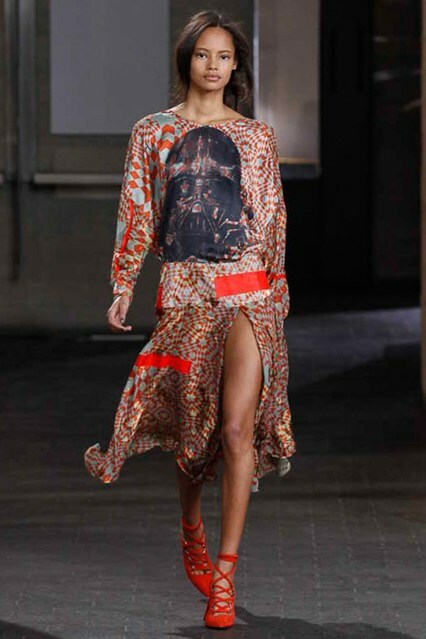 Darth Vader’s mask, as seen in films such as Richard Marquand’s « Star Wars Episode VI : Return of the Jedi », has influenced patterns in the Preen by Thornton Bregazzi Autumn/Winter 2014-2015 Show. To read about « Star Wars »-style collections, search for the « Star Wars » post that I have published on September 11, 2012. 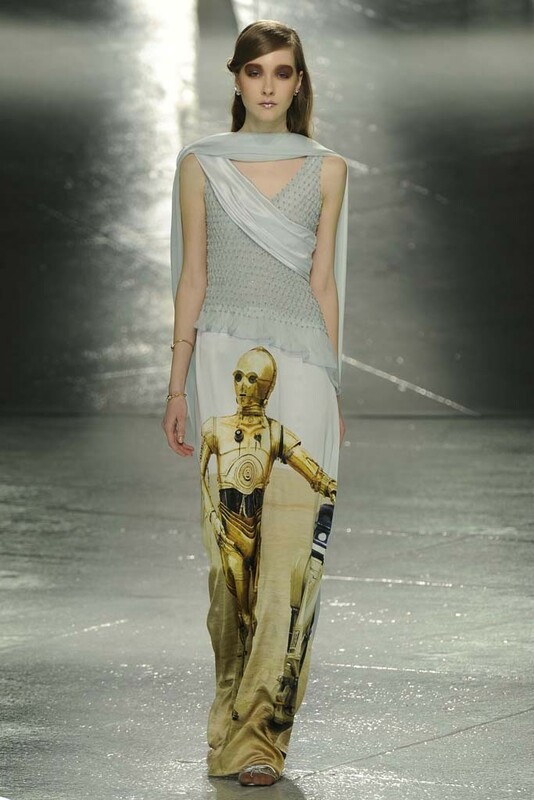 The finale of the nostalgic Rodarte Autumn/Winter 2014-2015 Show paid tribute to characters from Kate and Laura Mulleavy’s favorite film trilogies, such as « Star Wars Episode V : The Empire Strikes Back »’s C-3PO. The gold trousers of the Balenciaga by Nicolas Ghesquière Spring/Summer 2007 Show evoked « Star Wars »’ C-3PO. Other George Lucas’ « Star Wars »-style collections : Acne Autumn/Winter 2010-2011 (more specifically inspired by the « Star Wars : Clone Wars » comics), Adidas Star Wars Originals (« Star Wars »-inspired line, launched on January 7, 2010, and reiterated each season, in collaboration with Lucasfilm), Jean-Charles de Castelbajac Autumn/Winter 2010-2011 (Darth Vader-style helmets), Rag & Bone Autumn/Winter 2009-2010 (talking about this collection, Rag & Bone’s Marcus Wainwright said « I’ve always loved Star Wars »), Rag & Bone Autumn/Winter 2012-2013 (Rag & Bone’s Marcus Wainwright said that « Star Wars » inspired the « idea of armor », present in this collection, especially oversize epaulets). Moreover, the presentation of the Moncler Gamme Rouge by Giambattista Valli Autumn/Winter 2010-2011 Collection was inspired by George Lucas’ science fiction films, including « Star Wars ».